As some of you have seen on Plurk and Facebook,or have guessed by my silence, I do have a new laptop. I did try to post about it the weekend I got it, but blogger was being a doofus. 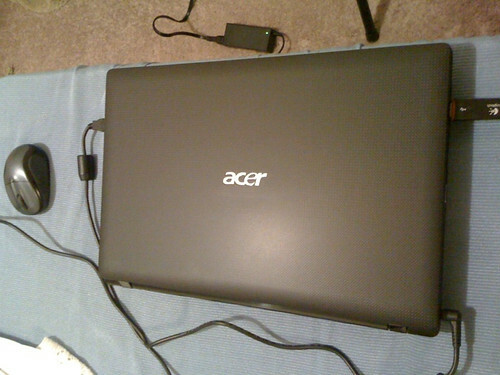 Like my previous laptop, this is an Acer. I really think they're quality machines but not expensive. This one has a bit of a rubbery texture on top, which is nice. 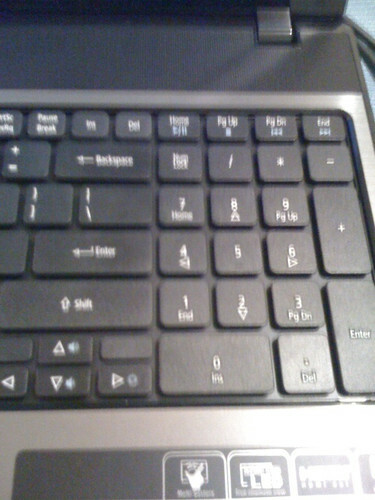 Also, it has a number pad! I am so grateful to my tech-savvy Sam, who was able to restore all my information. When I first booted it up, and opened Firefox, it loaded all the same tabs I'd been looking at! Even though my addiction to Facebook games has resumed, I have been staying busy knitting and such. 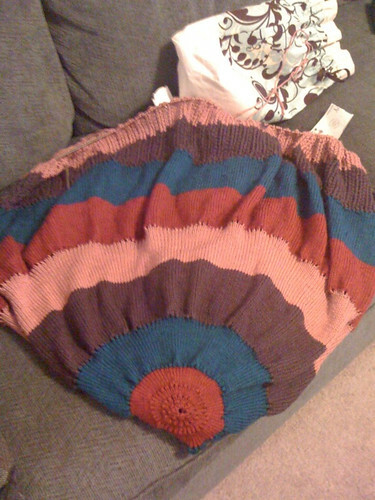 I have been steadily working on the blanket, which you may remember from the Olympic Knitting events last winter. I am finally close to being done! Just 12 more rows and then the bind off. 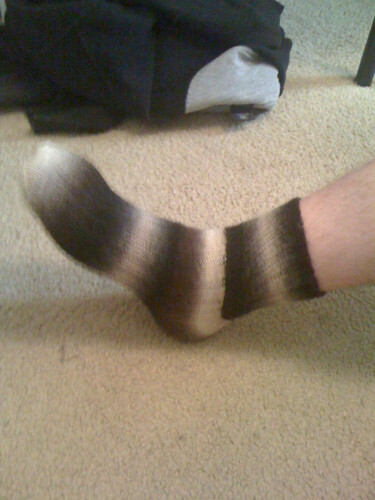 And keeping my promise to Sam, after finishing the pair of socks for me, I got started on a pair for him. I finished the first one this morning. 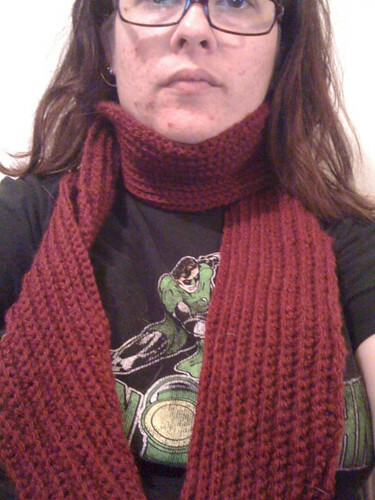 The yarn is Zauberball, and I knit it on my brand new Signature needles, which I LURVE. I like the color changes in the yarn, but there was one spot where I guess there had been a break and the manufacturer tied it. But it messed up the color change! I tried putting the heel there but it still drives me nuts. I figure mostly it'll be unseen though. Tomorrow I will blog again, finally reviewing something I promised someone I would before my old laptop even died! I will have to remember Acer laptops when I go looking for a new one here in the next few months. Congrats on the blanket almost being done & the scarf looks nice hmm what kind of cookies did you get for it lol. I love the way the sock came out I want to try some Zauberball eventually.